The Sun headline is a bit longer but I really do not like the term ‘super road’. In fact what the City Engineer is now proposing is a new network with several significant additions. Sadly the story does not come with a map or a link to the presentation council heard yesterday. The important point – and the one that needs to be reiterated for all those people who commented here (and elsewhere) about the impact on traffic – is that the viaducts are not necessary. The viaducts were built in the 1960s to carry as many as 1,800 vehicles an hour. But less than half that number use the viaducts now and that amount is declining as improvements to public transportation are made, Dobrovolny said. Which is pretty much the stance I took from the start. Indeed what is really different is that the “viaducts could be demolished almost immediately, paving the way for new housing and a neighbourhood park system, if the plan is approved by council this fall”. That is much better than the original idea that it could take at least 15 years, and is what I was calling for. a new road from Pacific Boulevard that connects to Prior, Main and Quebec Streets. bicycle and pedestrian bridge to connect from a planned park to Dunsmuir Street above. I think the most encouraging thing in the presentation is the amount of public support for this proposal. There is even bipartisan support on Council. Subsequently the Mayor has been trying to dampen everyone’s enthusiasm and suggest that it all needs to take much longer. 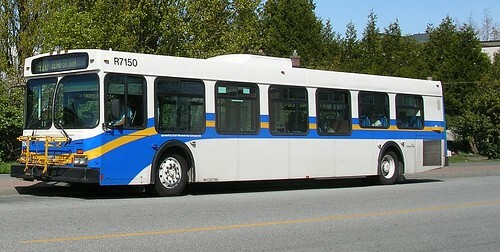 The Vancouver Sun announces that Translink is going to replace 25 buses. This is not exactly news – but then its the summer and the “silly season” when anything will do to fill the paper. 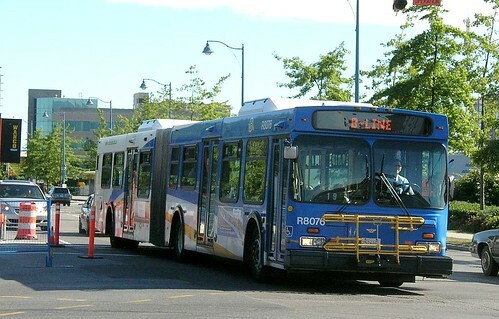 Bus life in North America is around 18 years – in terms of a life cycle cost analysis – but in the US transit authorities can use their federal funding to get replacements after 12 years. Or at least they could, if that hasn’t fallen to the steady assault on public spending in general mounted by Republicans in Congress over the last few years. So the “aging buses, the majority of which are diesel-powered and date back to the mid- to late 1990s” are due. If you can’t make the sums add up, remember that there is a “lead time” between the date the bus is ordered and when it is delivered. I am out of the loop now, but at one time it was as long as two years. The very odd insertion of the phrase “majority of which” makes me wonder if Richmond is really the origin of the buses being replaced. All of the Richmond buses are diesels. 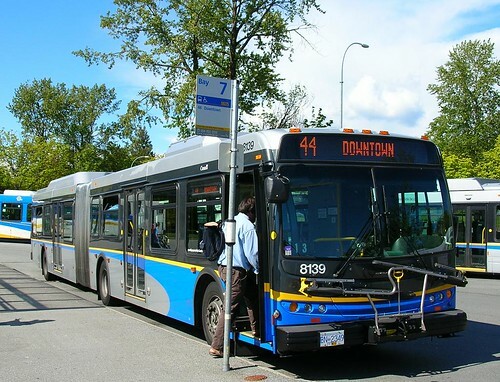 The only other power sources for Translink buses are electricity – all the trolleybuses are in Vancouver – and compressed natural gas all based in Port Coquitlam. There may be a few of the experimental buses used for fuel comparison trials still around. Oakridge seems to be the lair where these oddities have languished. CMBC’s coy habit of putting green canvas on its fences limits what can be seen from the outside, but maybe some insiders will comment below. Vancouver International Airport, where politicians and planners are fuming over the airport authority’s plans to partner with London-based McArthurGlen in building a massive luxury outlet mall. The proposed 460,000-square-foot mall will be three kilometres from the airport terminal, on 22 hectares in the southeast corner of Sea Island, near the bridge that crosses to Richmond’s Lulu Island. 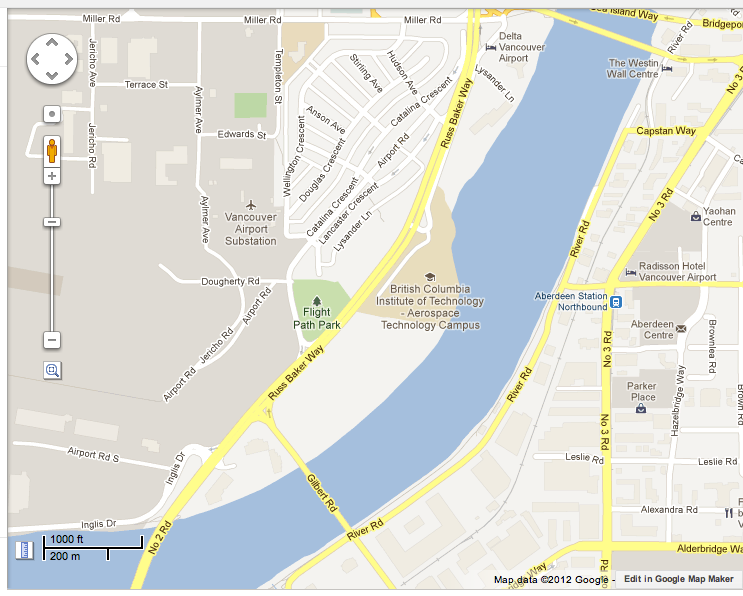 Both of them feed onto Russ Baker Way – and thence to the Arthur Laing Bridge. Thats three lanes of traffic plus the airport’s two which results in congestion and tail backs at peak periods – morning and evening. Richmond is questioning whether the airport has a mandate for a mall – when it is supposed to be running an airport. It seems to me that YVR can legitimately get into retail for airport users and staff – but a “luxury outlet mall” remote from the terminals seems to be stretching that more than a little. Moreover, the airport needs to keep some sense of perspective. The opening of the Canada Line has made a huge difference to mode share at the airport and allowed the authority to make much more profitable use of its limited curb space. But all that depends on the people who do not arrive by train having a reasonable chance of getting to their plane on time. Most mornings, AM730 is going to be reporting the same issue – back ups to 64th Avenue as now. It is in the afternoon that things will get hairy as people trying to get to and from the mall mix with all the other traffic. The AM peak is short and sharp: the evening peak is longer and heavier, and adding shoppers is not join got help anyone – especially those really desirable travellers who have spent a business day in Vancouver and now want to leave on time. YVR is, of course, completely unaccountable. Its board is appointed, and it reports – after a fashion – to Ottawa. Though for all intents and purposes it can pretty much do as it pleases. This is not winning it many friends. It is also a cash cow for the feds – who get ground rent from it. Quite a bit of attention is now turning to what this does to the famed “competitiveness” of this essentially private sector operation. They are losing local passengers, who are finding fantastic bargains a short drive away at Bellingham. Heck, you can even park at the terminal there for $10 a day for as long as you like (beware the predatory adverts from the park and fly merchants who offer much worse deals). At the same time Calgary is going after the “gateway to Asia” traffic with its own huge expansion. The only question in my mind is what, if anything can the City of Richmond and Metro actually do about it? The Tyee has a very good summary of the users’ case for retaining the TaxiSaver program. When the Taxi Saver cuts were first announced, TransLink indicated it was a budgetary decision that would save over a million dollars. More recently, TransLink has stated that money saved by cutting Taxi Savers would be re-deployed to finance improved HandyDart services. When I was employed by TransLink I was expected to examine the whole range of services to people with disabilities – mostly because as the economist I was expected to provide some professional advice on things which on a per passenger ride basis were extremely expensive. TaxiSavers were indeed introduced to increase mobility – but that was because the system itself was overburdened from the start – and always will be. The people who act as “gatekeepers” and certify that someone needs special assistance have no interest at all to save Translink – or the taxpayer – money. They meet the needs of their clientele. As they should. Other systems, like Calgary, have a much more stringent approach to determining eligibility, but that reflects a different kind of organization. There the City provides both transit and social assistance of various kinds: that is not the case with Translink. TaxiSavers halve the cost of a taxi ride for users. But they also greatly reduce the cost of the same ride compared to what it would cost Translink if it were obliged to deliver service using its own equipment. Transit is rationed here – mostly by the location of where people live. In fact people with disabilities who qualify for handDART and live in the outer suburbs may even enjoy more transit access than their neighbours who have no disability. But handyDART is rationed by trip purpose. Because there is so much demand, and trips must be booked in advance, trips for school, work or medical reasons take precedence. In reality that means that any trip outside those classes doesn’t get booked. Taxi Savers allow people to make trips at short notice and for any purpose at all. There is also no need to see if the trip can be shared with others. I think that the Taxi Saver program saved Translink a great deal, since it removed a lot of pressure to improve the shared ride, pre-booked system. There is an equity (or “human rights”) argument: imagine waiting in line for the #99 – but having to persuade an official before being allowed to board that your trip purpose fitted some predetermined category. Imagine further that you have some of the problems of aging or limited intellectual capacity – or are too principled to game the system. That is the situation that HandyDart users face everyday. It would be intolerable if it applied to the population as a whole, but somehow it is acceptable when applied to an identifiable minority. Who are supposed to be protected by legislation. And the Charter. The claim that the savings will go to improve service are sophistry – since the trips people make with TaxiSavers do not qualify for those prebooked trips which are always oversubscribed. But the Translink Board now is not accountable. Local politicians would never have dared have made this decision. But an appointed Board can have no conscience – it simply follows the mandate it has been given. The problem we have now is we are ruled by a bunch of politicians who think cutting taxes and public spending is always the right answer to every problem. And who believe that the way to achieve that is to cut service no matter what the consequences. So we have cut environmental protection – and people can set their drinking water alight. We have reduced all those “frills” in education like special needs assistants and librarians, and we wonder why our children now cannot find employment. In the US the Republicans have just cut federal funds to walking and cycling programs: they are the same people who decry the increase in demand for health services, because they are so expensive. In Britain, public transport was deregulated and most of the subsidies eliminated. Not long afterwards we started reading about a new problem – social exclusion. That is not a phrase we have heard much here. Expect to hear it more often in future. This is a bit of a departure for this blog. Generally speaking I tend to leave issues like landscape and gardening to the experts. In this weekend’s Vancouver Sun their gardening correspondent Steve Whysall has a longish piece about pleaching. As it happens, when we were in Paris recently we not only saw the results of pleaching, we also saw how it was done which means I have some photos – which had been on my hard drive and, until now, had not been posted to flickr. So, as with the piece about the Bombardier LRV mockup, I am going to try to do something in both channels. 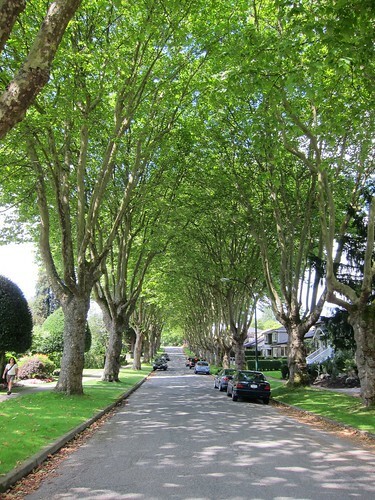 Pleaching is a type of pruning on trees that produces a flat top and sides – essentially a box sort of shape. 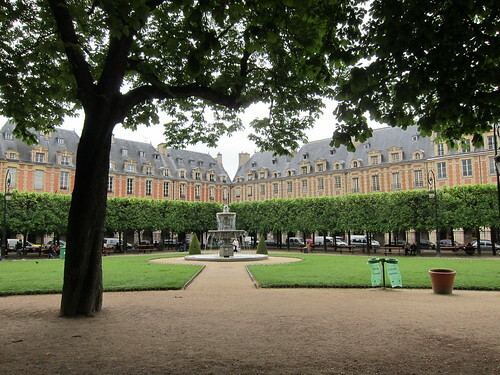 As Whysall remarks it’s “a classy way to give a street, courtyard, square, boulevard or avenue an elegant, formal look.” He wonders why it is not done more here, and I think the answer is simply that the traditions of gardening in France and England are different. The style most popular for the parks around the stately home were those fist adopted by Capability Brown. His style was to “perfect” a natural appearance and it almost completely replaced the formal patterns of gardens that preceded him. 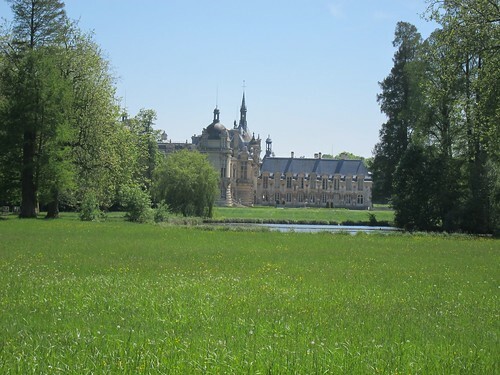 The formality of gardens in France, on the other had, tended to be preserved, although I was pleased to note that places like Versailles and Chantilly have English gardens in the Brown style. Whysall says “There is no denying it is a time-consuming exercise. It requires skilled workers and it is probably an expensive process.” This is based on his observations of some pleachers in Chartres. And he is probably right about what he saw there, as he is an expert at what he writes. 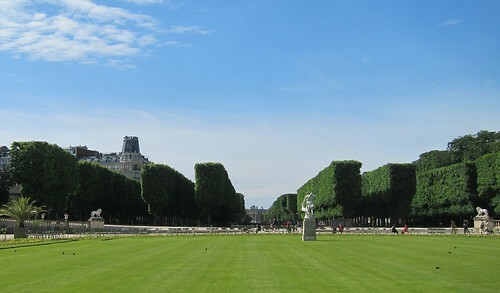 The approach at the Luxembourg Gardens which I observed was rather different. 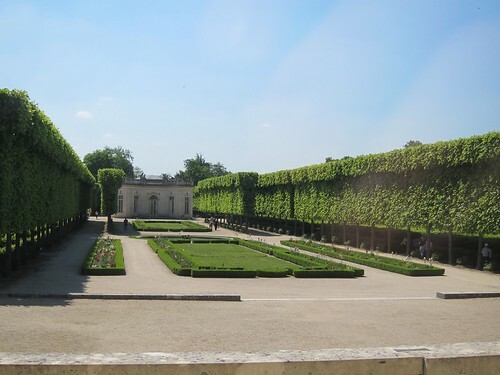 In the Luxembourg Gardens in Paris, for example, long avenues of giant chestnut trees have been pleached to create a superb formal, almost sculptural garden architecture with sufficient space underneath for people to sit, even have a picnic. But that is done with a truck mounted crane, on which the arm at the top has mounted a series of circular saws. This can be used vertically or horizontally – and looks very much like the large economy version of what happens to cedar hedges here all the time. 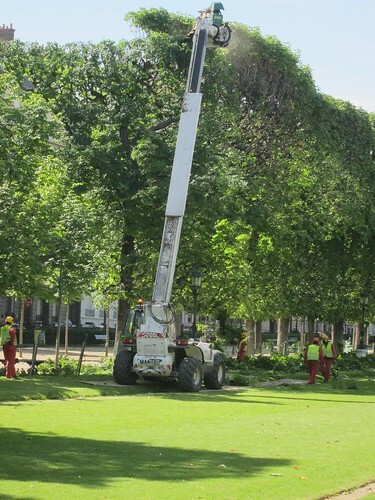 The truck moves forward slowly and the top – or the side – of the tree is just taken off. This is quite unlike the selective pruning used for most trees to promote tree health and vigour. Rather it is a simple matter of keeping the spread of the canopy in check. It is an approach which we would like to see applied more in Vancouver for very selfish reasons. 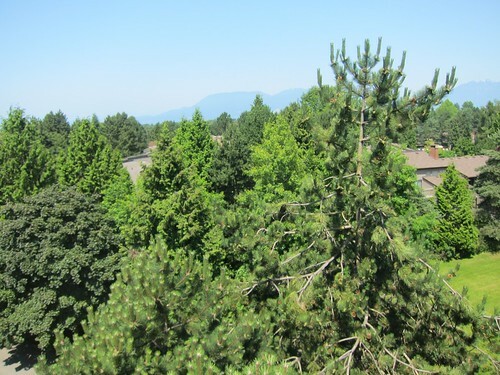 If you have a north facing window on the top floor of a six storey building put up around 30 years ago, you will have noticed that your view of the North Shore Mountains is steadily decreased every year, as the trees, planted at around the same time the building went up, reach maturity. 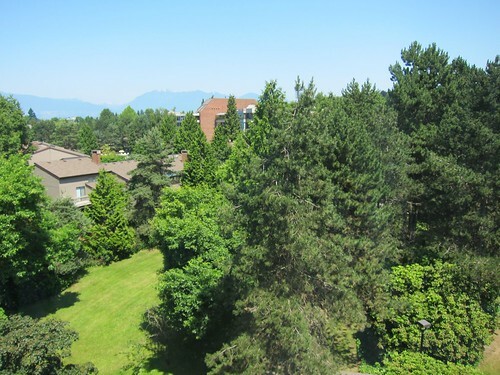 There was the notorious case of the West End resident who was so annoyed by the loss of her view that she simply poisoned the trees responsible for it – even though they were city trees planted in the boulevard. She was convicted and fined, but the social opprobrium heaped upon her was so great that she felt forced to leave town. 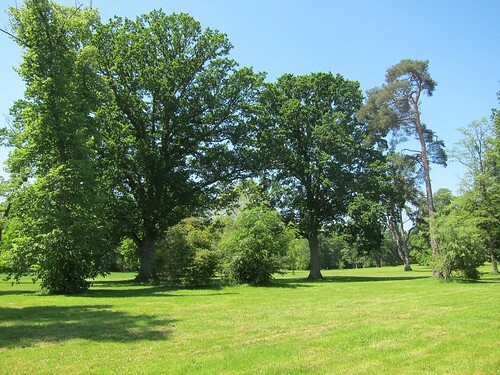 Some people – make that many people – feel deep affection for trees, all trees. And cannot bear to see them “damaged” in any way. Which, of course, lead to the great Stanley Park disaster, when large numbers of trees were lost in a windstorm and tree management policies were subsequently revised to be more pro-active. This morning, on a short walk for a different purpose I saw something that reminded me I had intended to add to this post a while back. 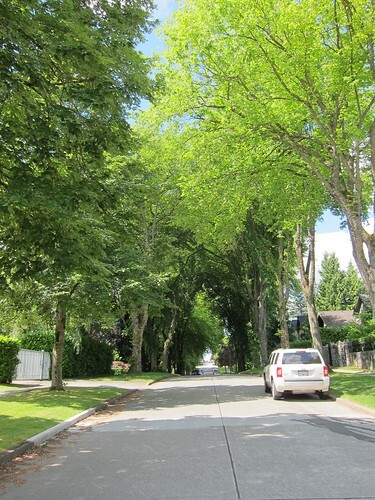 One of the nicest features of the west side of Vancouver are the narrow residential streets where the trees meet overhead, forming a green tunnel. I think that much of what Whysall wrote in his original Sun piece is quite simply wrong. 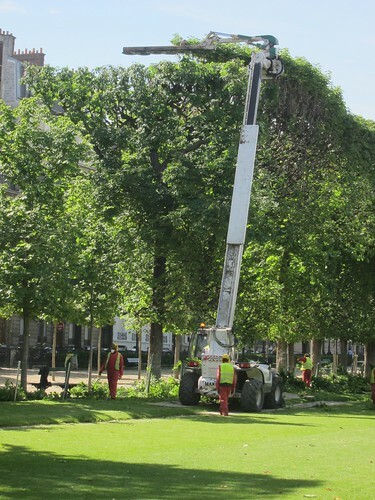 Pleaching is not exactly highly skilled if you can do it with a large and rather brutal piece of machinery, and the result does not necessarily produce a better result – certainly not if you are looking for shade. 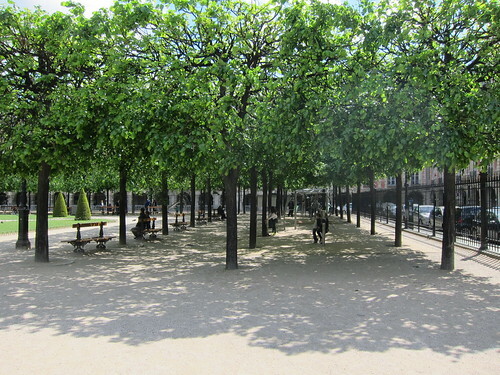 The way these trees have been allowed to grow creates a more inviting, human space. So in terms of streetscape I do not want to see more pleaching. Yes, it would be nice if the sixth floor view was clearer – but living in cities means we have to learn to get along with other people. The lessons of history are that the people who planned cities who did not actually like people (Hausmann, Robert Moses, le Corbusier) did not produce spaces that worked well for everyone. 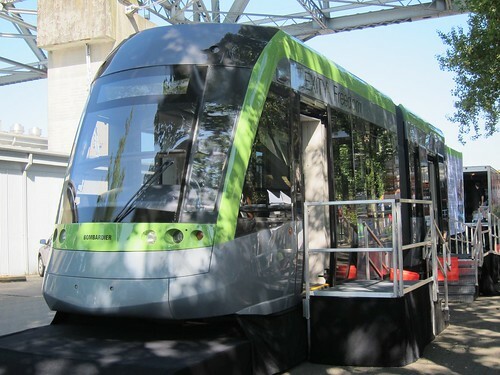 Bombardier has a mock up of the streetcar Light Rail Vehicle they are building for Toronto at Granville Island. Not at the DHR station, of course, which remains out of use – or even the Olympic Village station where they mounted a pre-Olympic event for the Brussels cars they brought here. This one is wider (2.65m) with two by two seating. And it is mounted on a truck chassis – so it is not quite as good a demonstration of its “low floor” quality as it might be. The mock up has doors both sides – and a mirror at the back to make it appear double ended. The Toronto streetcar is single ended with doors on one side only as it uses turning loops at termini. There is a wide clear area next to the door for mobility devices – and no doubt the cyclists will commandeer that if they can. In Paris it is the strollers that fill this area. And the sharp eyed will note that Mike Shiffer was an early bird visitor too. Now I do want to be fair, but it does seem to me that Bombardier could have made a bit more of an effort. It is true that this event is the second go here – they were out in Cloverdale, in Surrey for Canada Day. Maybe there was more organization there. There were media around today, and I am sure that the mainstream guys got their quotes and sound bites. But there were others, like me, who had their cameras and questions at the ready, even if they did not carry press credentials. They did have, on board, a full size brochure. One of the sales people dug one out when asked a question (about the hight of the step) that he did not know. The brochure went back into the carton with all the others. Of course you can get the info on line – but why keep the story from those who want to know? 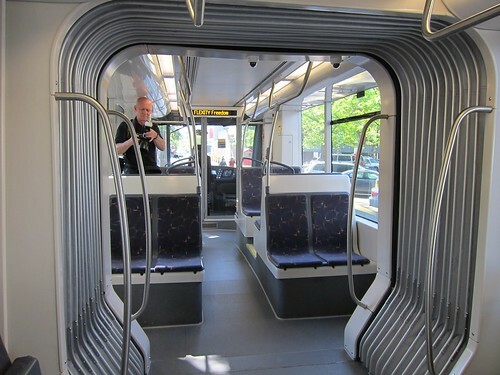 But didn’t they want this referred to as an LRV? 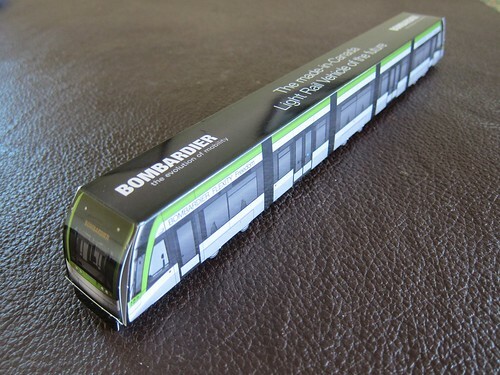 And how hard would it be to remove the stickers on the model that referred to the TTC? Yes I know the model and the publicity material was created for that market – and the western Canada is getting the benefit of the left overs. But Edmonton and Calgary both have light rail systems – and seem wedded to Siemens – one worth making an effort for, I think. And I am also unconvinced about the claim “Combination of 100% low-floor technology and conventional axle wheel-set bogies for a significantly smoother ride”. 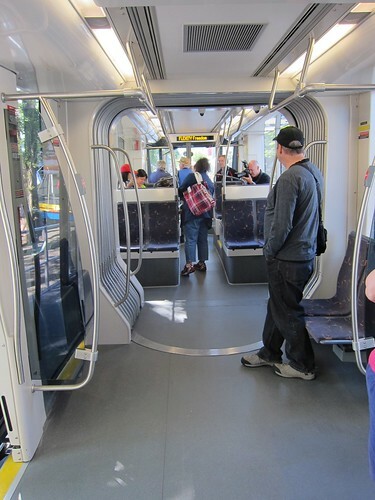 There was nothing wrong with the ride on the T2 and T3 trains I rode on in Paris recently – and they both have flat floors due to “unconventional” axles. Smoother than what? 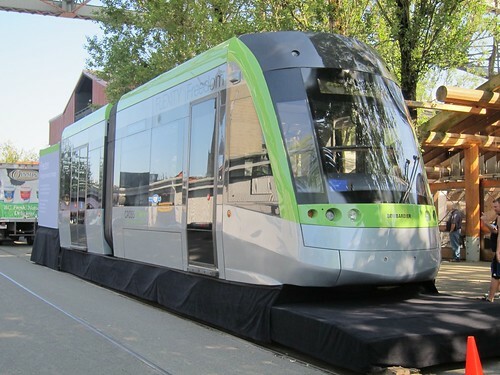 They are also Alsthom-Bombardier products (Citadis). 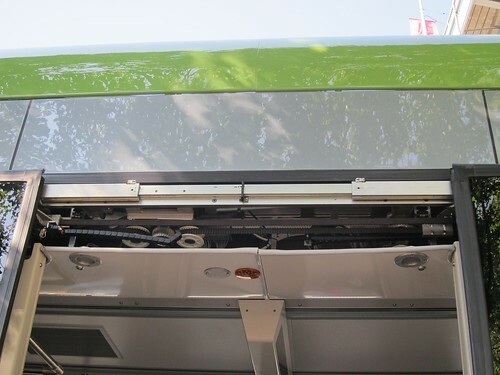 The floor of the mock up was definitely sloped over some quite significant areas – so I hope they have got the tie down issue sorted for passengers who are in wheeled devices. 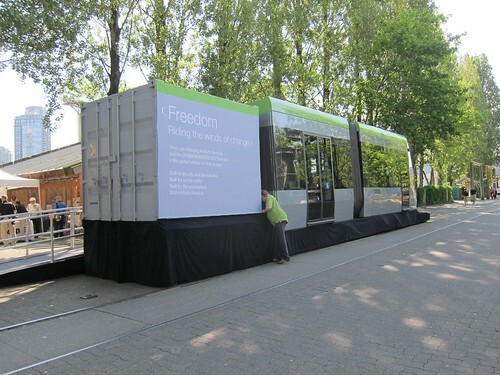 More information about Bombardier FLEXITY Freedom is available at: http://www.bombardier.com/en/transportation/products-services/rail-vehicles/light-rail-vehicles/flexity-freedom?docID=0901260d801a291a. 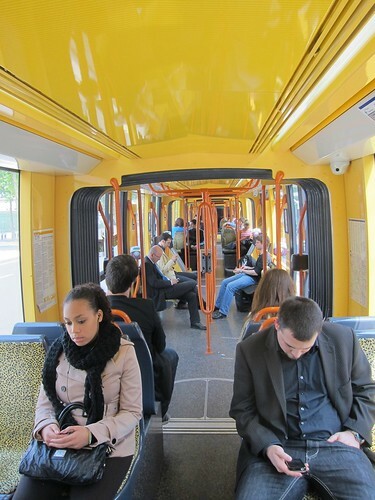 To illustrate the discussion in the comments section, this is the competitor from Alsthom, the Citadis used in Paris and many other french systems. The floor is both low and flat since it does not have conventional bogies.